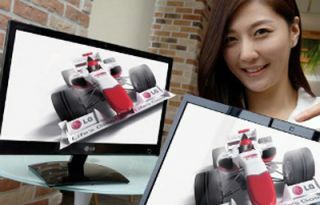 UPDATED: LG launches world's first 'no-glasses' Cinema 3D monitor, commits to 'naked eye 3D' future | What Hi-Fi? Just announced by LG in Korea is the world's first glasses-free Cinema 3D monitor – and the company says it gives a taste of the company's commitment to a future where 3D TVs no longer need glasses to create stereoscopic images. The 20in DX 2000 monitor, which sells for KRW1.29m (about £765), offers a solution to one of the major problems of such designs by using innovative eye-tracking technology to ensure the right pictures are sent to each 'channel'. Conventional glasses-free 3D displays use a 'parallax barrier' system, in which a filter in front of the display – essentially a series of lenses, like a fresnel design – ensures each eye sees different pixels, thus creating the 3D image. That's all well and good, but even slight movements of the head or viewing position can cause the image to collapse into 2D, or just a blur. LG's technology, which it describes as 'naked eye 3D' uses a webcam-style device built into the display to track the position of the eyes, thus ensuring the correct images are sent to each eye by adjusting the angle and distance of the 3D image. The company says it's the first to combine eye-tracking and parallax barrier technologies, and free viewers to move to different angles and positions without losing the 3D image. The display also has a 3D switch function to convert 2D movies, pictures and games. This announcement means LG now has a presence in each of the three 3D 'camps' – active shutter, passive (using its FPR technology and polarised glasses) and glasses-free –, and it says it hopes to secure a leading position in the emerging 'no-glasses' 3D market. Si-hwan Park, Vice President of the Monitor Division at LG’s Home Entertainment Company, says that 'With a full line-up of 3D TVs, laptops, projectors and smartphones, LG Electronics is by far and away the industry leader in all things 3D. The DX2000 is now on sale in Korea, and will be coming to other markets (as the D2000) later this year.